Anyone else get an abundance of fabulous sample sized variety packs as gifts? They seem like such a great idea to give, but once you receive them, you're all like... Okay what in the world am I supposed to do with all these. 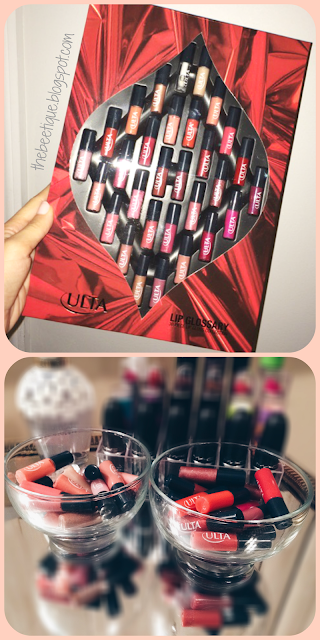 For example: I got this awesome Ulta Lip Glossary for Christmas - my eyes lit up, because I am a lip color hoarder, but it sat in its package for 2 weeks. It's almost like it looks much better on display in there. Finally I decided they need to be shown off, and not in it's Christmasy display box. If you have a significant amount of sample sized beauty products, I encourage you to put them on display in any type of jar or glass bowl to show them off. They're perfect for guests and add a fabulous touch to any surface!